BUYSOUNDTRAX Records is proud to announce the release of ROSWELL/COMMUNION, featuring new recordings of previously unreleased scores to the films ROSWELL, featuring music composed by Elliot Goldenthal (ALIEN 3, FINAL FANTASY, INTERVIEW WITH A VAMPIRE), and COMMUNION, featuring music by legendary guitarist Eric Clapton. Music from these films is presented here in new recordings produced and arranged by composer Brandon K. Verrett, Dominik Hauser and Steve Bartek. With this album release, BUYSOUNDTRAX Records presents a pair of late ‘80s/early ‘90s science fiction films about alien encounters, purportedly based on true events, or at least believed-to-be-true events by a large number of witnesses and UFologists. Released in 1994, ROSWELL was a made for television movie depicting the infamous Roswell UFO incident from 1947 in which the US Army allegedly captured a flying saucer and its occupants after it crashed near the Roswell Army Air Field in New Mexico and took great measures to suppress what it found from the public. ROSWELL was directed by Jeremy Kagan, starring Kyle Machlachlan, Dwight Yoakam, Martin Sheen, Xander Berkeley, Kim Greist, Peter MacNichol and Charles Martin Smith. Beginning in the present day, as the elderly soldiers of RAAF’s 509th Heavy Bombardment Group) celebrate their 30th reunion, ROSWELL focuses on Major Marcel (Machlachlan), the group’s Intelligence Officer, from whose perspective the story is revealed. Marcel, disgraced after being accused by his commanders (and the media) of mistaking a weather balloon for a flying saucer, attends the reunion along with wife (Greist) and grown son. Haunted by the experiences of the past, Marcel tries to connect with some of his former colleagues to find out what really happened. The music for ROSWELL was composed by Elliot Goldenthal, a young New York composer who had developed an unconventional, cerebral style of musical accompaniment for film, theater, and dance. His first major Hollywood composition was for the film adaptation of Stephen King’s novel PET SEMATARY in 1989, closely followed by DRUGSTORE COWBOY, ALIEN3 and DEMOLITION MAN. The music provides a documentary-like musical backdrop to the film; its claustrophobic, dissonant resonance is provided not for the suspicion of alien encounters but for the government machine itself and its need to suppress those encounters from the public. The 1989 thriller COMMUNION was based on novelist Whitley Streiber’s 1987 novel in which he relays his own experiences of being abducted and experimented upon by alien beings. The film was directed from Streiber’s screenplay by French-born filmmaker Philippe Mora. He was friends with Streiber and had actually accompanied him on one pf the weekend trips to the cabin where the abductions were said to have occurred. The film stars Christopher Walken as Streiber and Lindsay Crouse as his wife Anne. COMMUNION is a straightforward account of the events as Streiber described them, graphically depicting the abductions and experimentations through unusual camera angles and perspectives that generate a growing sense of unease as the story plays out. When it came time to look for a composer, the director came up with a unique solution. Mora had befriended guitarist Eric Clapton in London in the 1960s; in fact they were housemates for a time. Clapton’s music for the film serves to reflect the personality of Streiber as he is affected by his ongoing experiences with the extra-terrestrials. Brandon K. Verrett’s formal musical training began at age 11. After having discovered an interest in composing while in middle and high school, Verrett continued his studies at the University of Lousiana-Monroe, where he received a Bachelor’s degree in theory and composition. He also holds a graduate certificate in Scoring For Motion Pictures And Television from the University Of Southern California. Verrett’s scores have been featured in films for theatrical and television releases and have also premiered in both local and international festivals. In addition to composing, Verrett’s arrangements and orchestrations can be found in films such as PRIEST, DRAG ME TO HELL, UNTRACEABLE, THE INFORMERS and many other films. Originally from Switzerland, composer Dominik Hauser received his education at the Jazz School St. Gallen in Switzerland, earning a masters degree in music. His talent extends from composition and arrangement to instrumental performance, including bass work for jazz-funkers The Ruleless. He is the recipient of the coveted Prix Walo and has taken the stage at the Montreux Jazz Festival. In 1996 Hauser relocated to Los Angeles, where he re-entered the education arena. His studies took him to UCLA where he delved deeply into film scoring. Subsequently he took his skills to the realm of indie cinema and began composing for film. Hauser was a privileged participant in the ASCAP film-scoring workshop in 2000 and elevated to semifinalist status at the Young Film Composer Competition in 2002. Hauser has worked on films featuring such superstars as Vin Diesel (THE CHRONICLES OF RIDDICK) and Charlize Theron (AEON FLUX). His work involves him in a variety of projects, including cinema, theater and video games. Recently, Hauser completed arranging and orchestration on the restoration of the first Best Picture Academy Award winner WINGS for the 2012 Paramount Pictures centennial celebration. Steve Bartek is best known for his role as composer, producer and conductor for film and television (including NOVOCAINE, THE CREW, THE TICK and DESPERATE HOUSEWIVES), orchestrator for dozens of popular film scores (including CHARLIE AND THE CHOCOLATE FACTORY, BIG FISH and SPIDER-MAN) and as the lead guitarist, co-arranger and co-producer of the rock band Oingo Boingo. BUYSOUNDTRAX proudly presents ROSWELL/COMMUNION, featuring new exciting recordings of never-before-released music composed for these unique films. 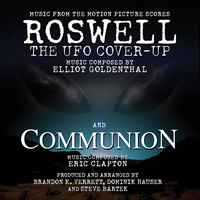 ROSWELL/COMMUNION includes liner wrotes written by noted author Randall D. Larson, discussing the music for these films and the process for reconstructing the music for this release.